The Amtrak train that derailed was the first regular service to use the “bypass” track that goes directly from Tacoma to DuPont, instead of a slow but scenic path along Puget Sound at Tacoma Narrows. 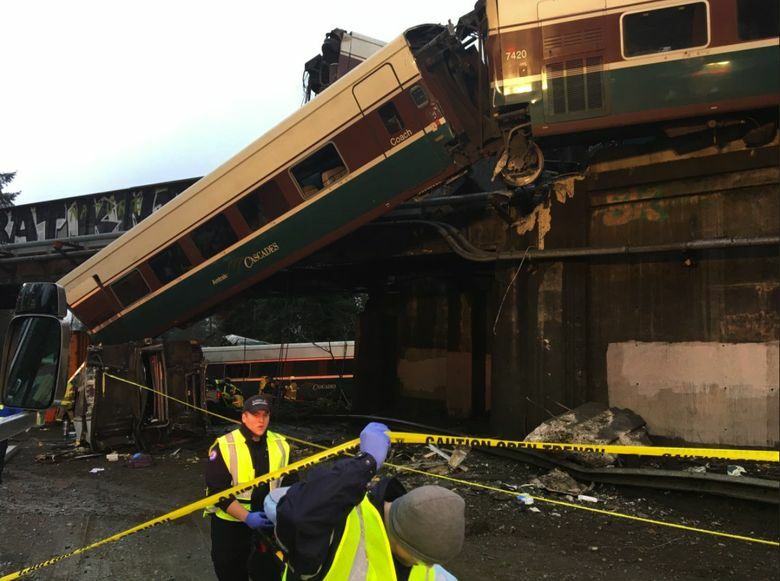 Monday’s fatal derailment of an Amtrak train occurred on a rebuilt, $181 million passenger corridor that was supposed to make the trip between Seattle and Portland more reliable. Amtrak Cascades 501, with 77 passengers and seven crew aboard, was the first scheduled trip to use a new 14.5-mile bypass track from Tacoma to DuPont, instead of a slow but scenic path along Puget Sound at Tacoma Narrows. The railcars derailed onto I-5 on an old overpass that was outfitted with new rails, said Janet Matkin, spokeswoman for the Washington State Department of Transportation (WSDOT). There are no switches in the immediate area, she said. The Associated Press said at least six people died, while dozens of others were transported to hospitals or treated by medics. This was the second Cascades derailment of the year. In July, a train ran a stop signal and was deflected into gravel near Chambers Bay along the Sound, causing some minor injuries. Washington state is one of the few regions investing heavily in passenger rail, a program marred by Monday’s tragedy, and its blockage of both rail and freeway networks. Sound Transit owns the track corridor. The passenger-rail retrofit was approved by regional voters in the Sound Transit 2 ballot measure of 2008, and by WSDOT’s rail division. Funding included stimulus money from the Obama administration, which sought to create faster rail across the U.S. Some states ignored or rejected federal aid, but Washington state ended up with about $800 million. The trackway near DuPont is meant to carry trains at speeds up to 80 mph. By improving tracks and switches, WSDOT hoped to reduce delays and lower travel times by 10 minutes between Seattle and Portland. Dignitaries on Friday rode the new inland route to celebrate its completion. Besides trackwork, the $181 million program includes the addition of two more Amtrak trains starting Monday, for a total of six round-trips, and a new Tacoma Dome Station that opened this month. The regional ST3 transit tax measure, approved last year, includes a promise to put Sounder commuter trains on the line south of Lakewood, so they reach future stations at Tillicum and Dupont. Positive train control equipment, to limit unsafe movements or halt trains before a collision, was part of the retrofit, but Amtrak said the controls were not in effect yet where the derailment occurred. Trains made test trips on weekends and off-peak hours at varying speeds up to 79 mph, since early 2017. 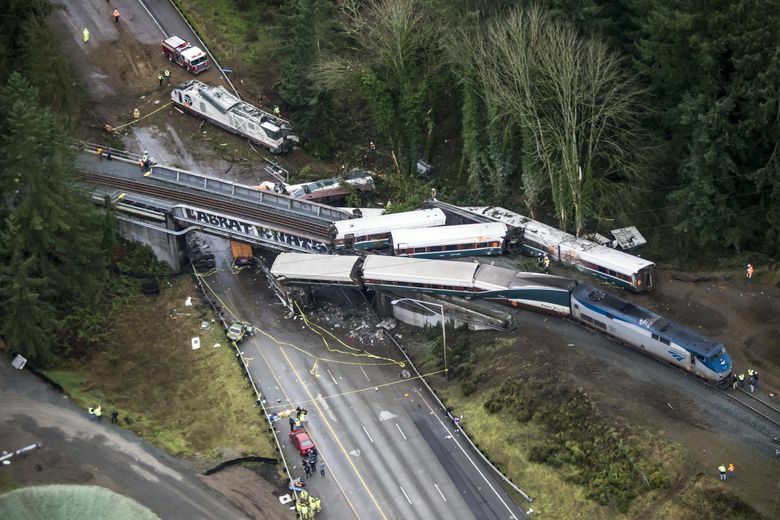 The derailment began on a curve approaching the overpass, where overhead photos show the southbound train’s front end traveled to the right, along the ground and onto I-5. Not everyone thought the rail bypass was a great idea. The city of Lakewood sued to halt the project, because of the threat of faster trains going through neighborhood crossings. In addition, the route crosses major arterials next to I-5 and Joint Base Lewis McChord. Monday’s crash occurred a mile from population centers. Amtrak now runs in a corridor that previously used just by slow, Tacoma Rail local freight trains. Sound Transit and WSDOT issued a public education campaign, including a video by Seahawks receiver Doug Baldwin, that people should expect faster trains than before. These are the first deaths on Amtrak Cascades trains in Washington state. In 1993, five crewmembers died in a head-on crash between freight trains at Kelso. Regional freight, including oil trains, continues to wind along the Narrows and Point Defiance. Freight trains combine with the Amtrak line in Nisqually, just south of the derailment site, and share the tracks continuing south. Because of the derailment, WSDOT says, the Amtrak Cascades trains will detour onto their former route along the waterfront.